Combining a few different types of fishing in Fort Lauderdale makes the day go by quickly and increases your chances of catching fish. And with the winter months bringing on kite fishing and using live baits? It’s the perfect time to drop a bait down for some of the snappers we have around here. And this is exactly what we did with Ashley, Brittany and dad Chuck the other day. Flying fishing kites is a very productive way to fish and we do it often this time of year. Primarily used for catching Sailfish, anything that eats in the sea will bite these baits. But as in all fishing, there might be a bit of a wait for that bite. So when conditions allow, we like to use an “entertainment rod” to keep our guests busy as they wait for that big bite. This is a rod that the guest actually hold themselves. We set it up and explain how to use it. It takes a bit to get used to it if you’ve never done it before but Ashley showed us once again that no experience is necessary… The bait is dropped down to the bottom or close to it and if they are biting? It doesn’t take long before the first hit is felt. Ashley wasn’t really into this fishing thing and was very casual in her holding the rod. That changed when the rod bent and began jerking in her hand. Adam was quick to help her get situated with the rod and soon she was reeling up what appeared to be a nice sized fish. It turned out to be a 10 lbs. Mutton Snapper, an excellent eating fish. We had already caught a few small Tuna and had just added to the menu. It’s my job to watch the kite baits when this is going on but in truth? It’s hard to concentrate on them when there is other action in the cockpit. 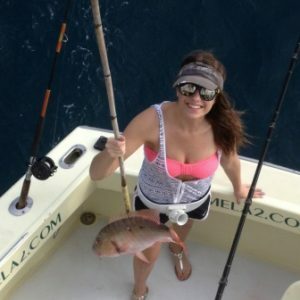 Brittney was next and caught a smaller Mutton that we had to release. Not only snapper will bite this rig and dad chuck got a nice bite and reeled in a small Silky Shark that took some time to land. We usually lose them as they bite through the line. The weather was changing and rain and wind was making the seas change. All in all, we ended up with the two Tuna and 4 keeper Muttons, the biggest caught by Ashley. The hard part now was finding a restaurant that was open on Christmas Eve day to prepare the fish. But we got that done too. And that’s snapper fishing, Fort Lauderdale style. Fishing while you fish. I like it! We can catch Sailfish year-round here in Fort Lauderdale but as the winter months approach, this is the time that fishing for Sailfish really improves. Each cold blast from the north moves the baitfish south and the Sails are close behind. So being in position with the live baits out in the kites is where we fish these days. But this kind of fishing takes patience. What might seem boring to a novice can become exciting in a mere second. And our group today had plenty of patience. Very few fish were being caught and little was being said on the radio but we knew this was our best shot. Something big was wanted and we love to please. Our first bite came on the bottom bait. Small fish had been picking at it, making the tip of the rod bounce. These little fish create noise which sometimes attracts a large fish to investigate and one did. The bite was fierce and bent the rod hard toward the water. But as we tried to set the hook, the line went slack and we had missed whatever had tried us. There were no teeth marks in what was left of our bait so that eliminates a shark. We set another bottom bait but never got the chance to see if anything was around. One of our kite baits was going nuts and soon, A sailfish appeared beneath it. The bite was classic and we had our first fish on. We usually move the boat ahead to help get the slack out but we say still for this bite hoping for a second fish. And as we set the hook on the first, a second one appeared and he too was hooked. We had to clear one of the kite baits to avoid a tangle but still had one out there and Tim and Tom began the battles. When 2 fish are hooked at the same time, they always seem to go different directions. You have to choose one fish and go after him, just playing the other as you go. Direction, size of the fish and how much line is left on the reel are the determining factors. 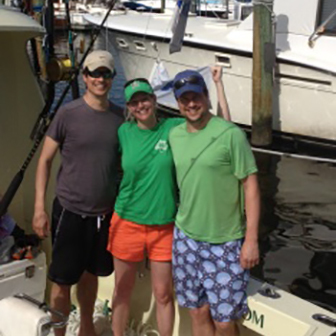 It took about 20 minutes to land the first fish and then we zeroed in on Tom’s sail. Remember that bait we still have out? Well, as Tom’s fish is getting close to the boat, another Sailfish ate that last bait and we’re back to 2 fish on at the same time. This third fish was landed by Susan after releasing the others. 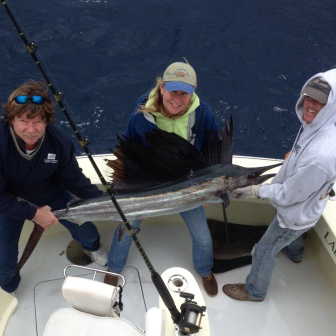 Sailfish fishing is improving off Fort Lauderdale. Expect it to get even better! While we may target Sailfish on our fishing charters here in Fort Lauderdale, it is seldom that we exclusively fish solely for just Sailfish. We like to keep our options open just in case something else happens by. With our first cold blast of this year’s winter season, we headed out on a grey, cool and windy day with Mark and his wife, Debbie, with Sailfish on our minds. With temperatures in the 50’s it wasn’t exactly comfortable unless you were from Wisconsin, which they just happened to be. Getting the kites set in the heavy winds was a challenge and with this strong wind from the north and a chop on the sea, these conditions were perfect Sailfish weather. Once that was done, we tried a little bottom fishing to pass the time as we waited for what we hoped would be our prize. But fishing was slow today, even the bottom was difficult to fish as the winds blew us along at quite a rapid rate. We managed a couple of reef fish that were not anything great and then caught a nice sized Mutton Snapper. Another bite on the bottom produced a small Cobia, too small to keep but still a nice battle. But our kites and baits had produced not a hit and time was running short. Then I saw what I thought was a small shark zipping around the short right bait. Many times when we see action, our perception of what is biting is based on the action and attack of the fish on the bait. A fin zipping around, moving in on the bait, striking it and then running away at a high rate of speed is many times how small sharks eat. But small sharks don’t jump when they are hooked and the Sailfish that had bitten our bait was now jumping… Debbie was in the chair and the battle began as the fish took huge amounts of line off the reel in mere seconds. Debbie followed Adam’s directions to a T and after about 15 minutes, we were at a stalemate. The fish was down deep and staying there. Only by lifting the rod slowly and then winding down, gaining valuable inches each time were we able to get the fish up near the surface. A 40 minute fight and Debbie never wavered.